Food exports grew 2.1% in 2014 and are expected to increase further in 2015. The Belgian food sector recorded modest turnover growth of 0.3% in 2014, reaching EUR 48.3 billion. Companies active in the food segment increased their investment by 11.9%, to a record EUR 1.3 billion. 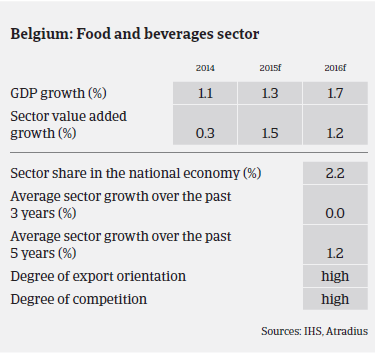 When taking into account direct and indirect jobs, the Belgian food sector employs 187,000 people and increased its share in the Belgian manufacturing industry to 17.7% in 2014. Food exports grew 2.1% in 2014, resulting in a positive trade balance of EUR 3.9 billion, which increased 11.8% compared to last year. While France, the Netherlands and Germany still account for the largest share of total exports (57%), deliveries to overseas markets recorded a whopping increase of 12.5%. Very large increases were recorded for exports to the US (up 17.4%), Brazil (up 31.9%) and China (up 23.6%). Subsectors with the strongest export performance are meat, dairy, fruit & vegetables, cereal and beverages. Quality and safety standards as well as process and product innovation are key selling points abroad. The Belgian food sector also excels with organisational and marketing innovations. Exports are expected to increase further in 2015, creating more jobs in the industry. 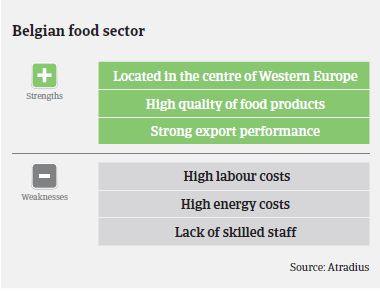 However, the Belgian food sector also faces some challenges that hamper its performance: besides high energy costs, which mainly affect smaller businesses, the food sector has difficulties in hiring staff with dedicated skills required in the industry (e.g. technicians, machine operators). At the same time, labour costs are more than 20% higher than in France, Germany and the Netherlands, countries which host big competitors. This has had a negative effect on the profit margins of many Belgian food businesses. That said, the recent boost in investments should help ensure that the food sector increases its productivity, helping it cope with mounting price pressure from high domestic labour and energy costs. Belgian food companies have been facing declining raw materials prices since 2014. While this has negative consequences for farmers and growers, it creates opportunities for processing companies. It is however vital to hedge against such price swings in order to reduce risk on the already narrow margins. The food sector has seen a slight improvement in non-payments and insolvencies (84 insolvency cases between January and September 2015, compared to 88 cases in the same period of 2014). 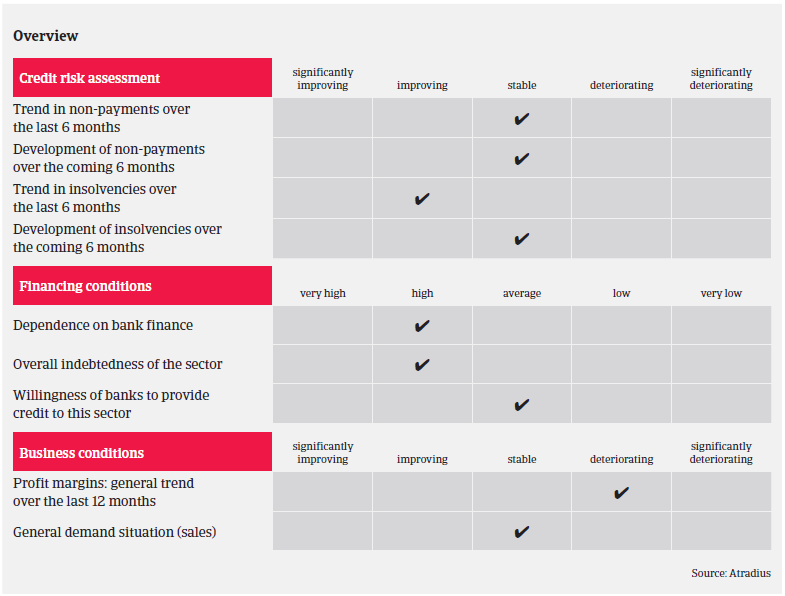 It is expected that the level of payment delays and insolvencies will remain stable in the coming six months. Despite continued growth in the food sector, our underwriting stance remains generally cautious. The meat subsector suffers from margin pressure and high competition, while a consolidation process is on-going in this segment. Some meat exporters are negatively affected by the Russian food import ban, which has also increased pressure on the fruit and vegetables segment. Milk prices have decreased as a result of the abolition of EU milk quotas, and this will probably have a negative effect on producers, while being an advantage for processors. We take into account the seasonal trends that affect most food subsectors and manage credit exposure through time-limited cover. Despite our generally cautious stance, we try to find ways to provide cover by obtaining additional information, for instance, good payment experience or a guarantee from a stronger parent company.